The 3DS eShop is no stranger to strategy RPGs; aside from retail heavy hitters like Fire Emblem: Awakening and Fates and Stella Glow, it's also been blessed with smaller but still eminently enjoyable experiences like Ambition of the Slimes, and the surprisingly solid Mercenaries Saga 2. 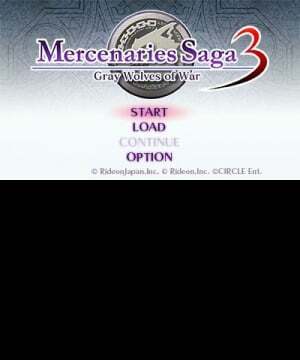 CIRCLE Entertainment was responsible for bringing that last title Westward, and now it's back with the followup - Mercenaries Saga 3: Grey Wolves of War. While it doesn't stray far from its predecessor's path, nor reinvent the turn-based wheel, this is still a quality title that's well worth a shot for strategy fans looking for a quick fix. 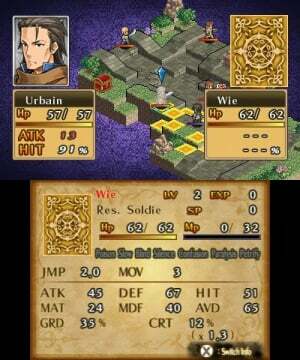 Mercenaries Saga 3 takes place in the midst of a trans-continental catastrophe. Two landmasses, north and south, are both under the control of the fiery northern Flare Kingdom, after the expanding empire took advantage of civil war on the southern continent of Kirialos to invade and colonize its neighbours. Their military might made short work of Kirialos' rulers, but grassroots resistance quickly grew and the Kirialos Liberation Army rose out of the ashes, its sights set on throwing the Flare Kingdom out of the picture once and for all. To combat the uprising, the Flare Kingdom sends in bands of mercenaries — known as 'The Kingdom's Dogs' — and that's where our heroes come in. You play as the Grey Wolves, a dogpack of mercenaries consisting of leader Marion, Urban the archer, Arabelle the nun, and Celeste the thief. You'll lead this ragtag D&D party as they navigate the changing tides of war, pick up new members along the way, and try to do what's right in a turbulent world. 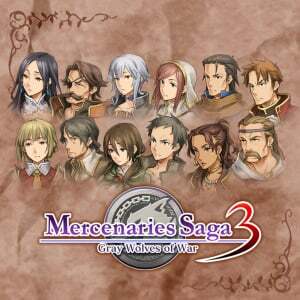 It's far from the most original setup, and the characters — aside from Arabelle's wide-eyed obliviousness — aren't particularly compelling, but the narrative does its job: getting you right into Mercenary Saga 3's enjoyably straightforward strategy-RPG gameplay. The action take place in discrete missions, where you'll lead your small company against enemy armies in grid-based, tactical combat. On your turn you'll be able to move each of your combatants across the grid one-by-one, putting them into position and choosing a direction for them to face when they've reached their destination — important for absorbing enemy attacks, which do more damage if from behind. If you're close enough to a foe before ending your action, you'll be able to attack or perform any number of buff, debuff, or offensive spells within range. As in many SRPGs, you can see how much damage your unit will dish out before you leap — along with how much they'll take in return — and the skirmishes take place right on the field, rather than cutting away to separate battle screens as in Fire Emblem. All of this will be well familiar to genre fans, but it's a popular template for a reason: the chess-like battles that take you through Mercenaries Saga 3's campaign are satisfying, strategic and fun. 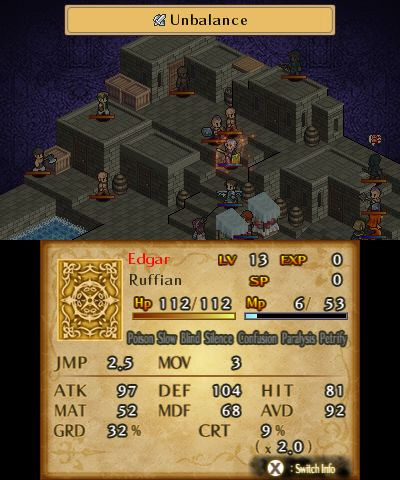 It takes after Final Fantasy Tactics more directly than Fire Emblem — from the isometric perspective to the more puzzle-like, multi-tiered maps — though the character growth system feels reminiscent of the latter. Each unit has their own class tree, and once you start to promote them, by spending earned Skill Points past level 10, you can choose between two routes; Celeste can continue on from theifdom by becoming either a Scout or a Tracer, for instance, and then onto various jobs from either of those. 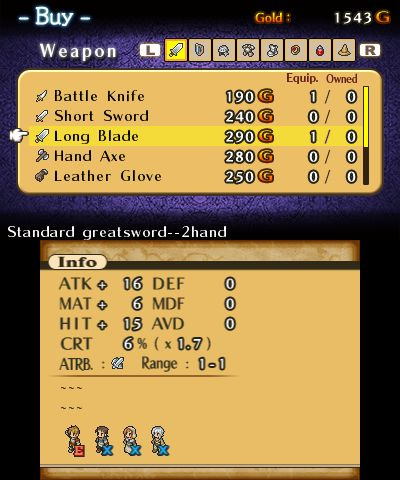 Classes affect not only skills and stats, but also which weapons a character can wield and — in a time-honoured tradition — their sprites. One unique twist Mercenaries Saga brings to the table is the 'Aggro' system, which affects how likely your units are to be targeted by enemies. The more you send your fighters into the fray, the more their Aggro gauge increases — as visualized by a number over their heads you can view by hitting 'Start' — and the higher the gauge, the more of a target they become. In theory, this should lead to interesting strategic repercussions; do you spread out the aggression among your army members so no-one becomes too much of a target, or do you focus your ire on one unit and use less-targeted allies to back them up and pick off comers from the sides? In practice, however, we never really noticed it coming into play. That could be due to other games having similar systems running secretly under the hood, or it could be because the strategies we employed didn't result in much of an Aggro imbalance, but either way, apart from checking our gauges every so often it didn't seem to affect our play for better or for worse. Along with the Aggro system, Mercenaries Saga mixes things up a bit in terms of MP, the mana points used to cast spells and use abilities. In most strategy RPGs, your character will begin a battle with a set number of MP or its equivalent, and expend it to perform spells, skills and attacks. Here, however, all your characters actually start with 0 MP, and raise it at a certain rate per turn. While this might not make the most thematic sense in the world, we loved how it worked out in gameplay terms; it gives a new and satisfying sense of purpose to those first few turns spent shuffling your units into position, and pulling mages and skill-users back from the fray to 'recharge' added a new dimension to front-lines management that we really enjoyed. Skills in general, in fact, are handled in an interesting way here. Rather than learning them automatically on level-up, you'll earn Skill Points in combat, and be able to spend them between battles to acquire new abilities or upgrade old ones. Upgrading skills comes with another unique touch: while typically skill upgrades in similar titles lead to either increased power or decreased MP consumption — or both — here, more power always means you'll be spending more MP. This makes for some interesting decisions about what to upgrade on which unit; if you have a dedicated healer with an attack spell on the side, would you upgrade the attack for more power? Or keep it at a lower level, so that dishing out damage won't rob as much MP from your pool for healing purposes? Aside from deciding how to allocate your Skill Points, you'll also be able to buy and sell equipment, synthesize magic items, and engage in free battles for EXP between missions. Equipment is handled particularly well, with the weapons and armour in each character's inventory greyed out unless you have something else to replace it with, in which case a small but straightforward icon set will tell you what's an upgrade and what's not at a glance. 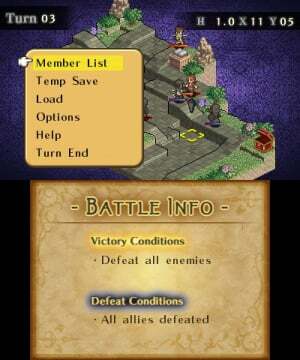 Aside from the occasional descent into menu hell (a regrettable but almost inevitable staple of the genre), the UI and controls are well done, and though they lack the smoothness and speed of Fire Emblem's polished setup, there are a few nice touches that we really appreciated. First is the ability to choose the orientation of the D-Pad for the isometric perspective — two options let you set 'up' on the D-Pad to move either northeast or northwest, for whichever clicks better with your own spatial reasoning. Next is a smart split in functionality for the shoulder buttons, where 'L' cycles through all of your own units that haven't yet taken an action that turn, and 'R' cycles through enemy units. We've seen plenty of games use both shoulder buttons for the former, but the thoughtful division here is a great implementation. Finally, we appreciated the optional difficulty levels, which affect not only enemy strength, but also whether or not your units regain HP when they level-up in battle. 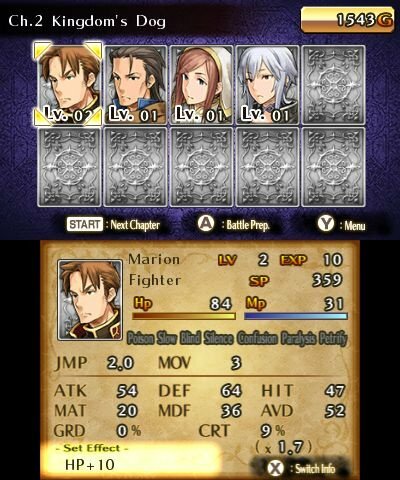 Graphically, Mercenaries Saga 3 is nearly identical to its predecessor, but that's not necessarily a bad thing. The charming pixel-art look and isometric perspective combine to make maps feel like colourful 16-bit dioramas, or self-contained miniature worlds floating in space. Character portraits are crisp and nicely detailed, and the interface is well done as well, with notably pleasant fonts and colours. It is, however, completely 2D, with no stereoscopic 3D effect at all — a shame, considering the art and stage design seems tailor-made for 3D depth. The music doesn't fare as well as the graphical presentation, unfortunately. The tunes themselves are decent fantasy fare, if not particularly memorable, but they have a serious shortness problem: 20-second loops try their best to last through the 10-or-so-minute missions, but they just can't cut it, and the repetition quickly becomes grating. The jingles for events like leveling-up have a similar problem, in that they don't always (or ever, really) mesh well with the music but always overlap with it, so each little triumph is accompanied by unpleasant key-clashes of dueling melodies. The writing is similarly hit or miss, and though for the most part the translation is decently done, there's at least a bit of grammatical wonkiness in almost every exchange, and spelling errors pop up often enough to be distracting. There are some genuinely funny lines in here, however, and though none of the characters are particularly well-drawn in and of themselves, occasionally inspired moments do shine through. Mercenaries Saga 3 stands out; not for any particularly compelling features, radical design decisions or memorable characters, but rather for the simple fact that it's a commendably competent strategy RPG that comes cheap as chips. 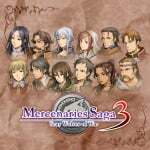 It doesn't do much to distance itself from its predecessor — Mercenaries Saga 2 — so veterans from that campaign may find a bit of fatigue here, but if you're fresh to the battle there's plenty to enjoy: satisfying gameplay, quick pacing, and an appealing art style make a lack of overall originality and smaller presentational hiccups more forgivable. The 3DS isn't short on exceptional experiences in the same vein — Fire Emblem Fates, Devil Survivor 2, and Stella Glow are all must-play examples of the genre — but if you're looking for something quick and fun that won't break the bank, this is a more than adequate eShop option. Well, it's a war simulation. I wouldn't smile either. Still have to get the first one, though. i loved final fantasy tactics on the GBA. Played it to death and Mercenaries Saga 2 & 3 are a great substitute and the price is at a very good price point. While they keep making these titles I will keep buying them. I tried MS2 some time ago, seems solid enough and this one seems to follow suit. Undoubtedly I will get this one too at some point. I'd pick up the trilogy as a cheapish download on the switch, just because there won't be anything really like that at launch. I picked this game up as soon as it came out. I found it simple enough to pick up on the game mechanics and easy enough to pick up when I have the time to actually play games. The story isn't bad, the characters are a fun, and the graphics aren't going to blow you away, but they don't need to. I had forgotten how much I enjoy playing SRPGs. This inexpensive little gem sure brought back my love for these types of games. These games (along with the Labyrinth Story series which shares assets with it) are gold. They're the video game equivalent of comfort food. Nothing mind-blowing, but it's right there when you've got a craving and it satisfies. @AlexSora89 You'll be back for Switch time, at least! While soundtrack and story writing play a big part on my personal way of choosing my games, the presentation and gameplay reminiscing of FFT and FE are enough to make me want to try this one out. @AlexSora89 That sounds amazing, have fun! @AlexSora89 I'll post as many animated gif and memes in your absence as humanly possible, I'll leave the song lyrics to you though. Have a great time, don't worry about us, enjoy vaca. 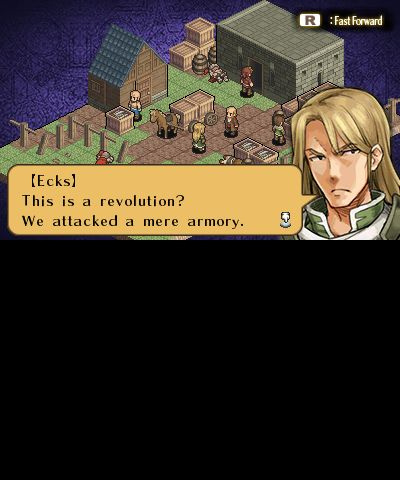 Mercenaries Saga 2 was probably the most standard and generic game I've ever played. That being said, sometimes its nice to just play an ordinary, no frills attached strategy game. Don't expect a masterpiece, but this series is okay. I wish my backlog would allow me to have time for this... I particularly liked what I sampled from MS2. @CharlieSmile Yeah, I think the fact that they all hover around that $5USD/$7CDN mark only helps my comfort food analogy. Yeah, I will but I'm afraid I won't buy it at launch for the reasons I've already explained - I'm using that money to fund a course to get a job with. Basically that will allow me to use my Krav Maga skills to work, so yeah. That said, the money I will - hopefully, eventually - earn will then go into a shiny new Switch! I leave my GIF duties to you, I know they're in good hands! Keep the "being fun, fine fellows" flame alive until I get back! Greetings from the olive garden part of Italy, everyone! Very much reminds me of classic Fire Emblem from the looks, which is definitely a good thing. @Frosty_09 War isn't fun. I suggest you stick to dating sim new Fire Emblem games.